Jan Smit, Alblasserdam (circa 1905); sale, Mak van Waay, Amsterdam, 10 February 1919, lot 35. M. Rutgers, The Hague; sale, Sotheby & Co., London, 9 July 1958, lot 181. W.J. Holliday, Indianapolis (acquired at the above sale). Anon. sale, Sotheby & Co., London, 10 December 1969, lot 34. Brook Street Galleries, London (by 1970). Acquired by the present owner, circa 1980. Letter of Vincent van Gogh to Theo van Gogh, July 1884. J.-B. de la Faille, Vincent Van Gogh, Paris, 1939, p. 62, no. F.40 (illustrated; with incorrect support). J.-B. de la Faille, The Works of Vincent van Gogh, His Paintings and Drawings, Amsterdam, 1970, p. 56, no. F40 (illustrated; with incorrect support). I.F. Walther and R. Metzger, Vincent van Gogh, The Complete Paintings, Cologne, 1993, p. 45 (illustrated in color; with incorrect support). J. Hulsker, The New Complete Van Gogh, Paintings, Drawings, Sketches, Amsterdam, 1996, p. 116, no. 507 (illustrated, p. 117; with incorrect support). Rotterdam, Kunstzalen Oldenzeel, Vincent van Gogh, May 1903. Rotterdam, Kunstzalen Oldenzeel, Vincent van Gogh, 1905. The Dallas Museum for Contemporary Arts, Impressionists and their Forebears from Barbizon, March-April 1961, no. 63. The Van Gogh Museum has confirmed the authenticity of this work. Painted in Nuenen in early August 1884, Oude Toren bij Zonsondergang is an accomplished painting from Van Gogh's formative Dutch period and depicts a recurring motif from this time (fig. 1). He wrote to his brother Theo, referring to the present work: "And I have also been working again on the old tower in the fields in the evening; I've made a larger study of it than my previous ones--with the wheat fields around it" (Vincent van Gogh, The Letters, The Complete Illustrated and Annotated Edition, London, 2009, no. 452). After following courses in anatomy, composition, and perspective at the Académie Royale des Beaux-arts in Brussels and a period in The Hague, the thirty-year old Van Gogh decided to return home to his parents, who were then living in Nuenen, in 1883. This decision, given the artist's age and difficult relationship with his father, can be explained by financial necessity and also by Van Gogh's deep-seated desire--induced by a visit to an artists' community in northern France in 1879-1880 and a passion for the novels of the French Naturalists--to become a painter of peasant life. During the following two years that he spent at Nuenen before setting out for Antwerp and then for Paris, Van Gogh's principal subject was the local Brabant peasantry. His "counselor and guide" in this work, as he wrote to his brother Theo, was Jean-François Millet, whose powerful paintings of weary laborers Van Gogh deeply admired throughout his career (Letters, no. 493). George Keyes has written, "Having solidified his view of the peasant as the embodiment of universal human values, when he moved to Nuenen working peasants became his major project, and for the artist, they also became the chosen subject of modern art. By making this commitment, Van Gogh allied himself with Millet, Jules Breton, and other French painters of the realist tradition who extolled peasant subject matter" (Van Gogh Face to Face, The Portraits, exh. cat., Detroit Institute of Arts, 2000, pp. 39-40). It is in this context that we can understand the present painting. 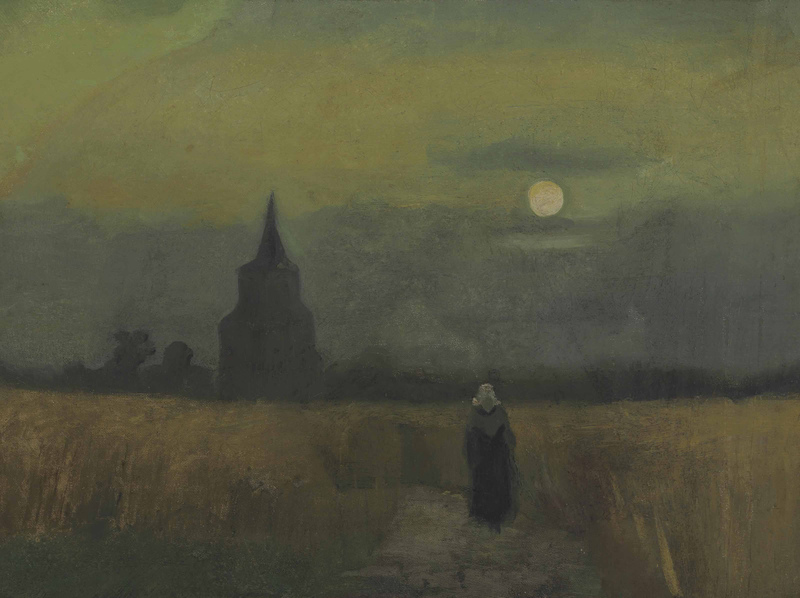 A countrywoman wearing her distinctive white cap stands in a wheat field bathed in moonlight. The warm yellows and browns of the wheat and the solid, solemn tower and foliage at the edge of the field contrast with the deep blue and grey of the luminous sky. The painting embodies the concept of the landscape as a vehicle for feelings and sentiments, a factor that he would continue to develop for the rest of his career, culminating in the landscapes he would create half a decade later in the South of France. Examination under x-ray by the Van Gogh Museum has revealed that Oude Toren bij Zonsondergang is painted over a composition depicting a local weaver seated at his loom, which was likely painted in January or February 1884. We know from Van Gogh's letters that he executed three paintings of this subject around this time and only two known paintings have been linked to those mentioned in the letters (fig. 2). The third is the underlying work. Between 21 and 24 January, Van Gogh wrote, "when I'm not with Ma I'm at a weavers nearby, where I'm working on 2 painted studies" (Letters, no. 427). Van Gogh made his first watercolor drawings of weavers in late December, choosing his subjects from among those who lived in his neighborhood. The skills that he acquired in painting the figure in a fully developed interior would pay considerable dividends when he turned to work on the two versions of the famous Aardappeleters (Hulsker, nos. 734 and 764), the masterpieces of his early career, which he completed in April and May 1885. Life in Nuenen proved more wearisome than expected for Van Gogh. The artist's poor financial conditions restricted his access to painting materials, forcing him to occasionally re-use canvasses and making him increasingly reliant on his brother's generosity. Despite these hardships Van Gogh concluded his letter that mentions the present lot by saying; "Well, I write in some haste because I'm hard at work, I work a good deal early in the morning or in the evening, and then sometimes everything is so inexpressibly beautiful" (Letters, no. 452).